Since theirdiscovery 40 years ago, pulsars ?? the rapidly spinning, highly magnetizedcrushed cores of exploded stars ? have largely been detected via the pulsingradio signals emitted by their lighthouse beam-like jets. But astronomers have suspectedthat these pulses give only the slightest hint of the true power of thesecosmic dynamos. With thelaunch of NASA?s FermiGamma-ray Space Telescope (formerly GLAST) in June of last year, scientistsare finally getting a glimpse of the powerful hearts of these stellar beasts.In its first four months of operation,Fermi detected more than three dozen pulsars, 12 of which are new gamma-ray-onlypulsars. "Weknow of 1,800 pulsars, but until Fermi we saw only little wisps of energy fromall but a handful of them," said pulsar astronomer Roger Romani ofStanford University in California. "Now, for dozens of pulsars, we'reseeing the actual power of these machines." Theastronomers now find that some pulsar bursts are generated far above the star'ssurface. Romani andhis colleagues presented the Fermi findings earlier this month at the annualmeeting of the American Astronomical Society in Long Beach, Calif. Romani saidthat these were just the "first wave of such discoveries," and thatthey will usher in "a new era of high-energy pulsar physics." Pulsars(short for "pulsating star") were first discovered in 1967 by JocelynBell Burnell and Anthony Hewish. The astronomers were perplexed by theincredibly regular radio emissions they detected; they first thought they couldbe transmissions from extraterrestrial civilizations. Astronomerslater determined that pulsars were actually rapidlyspinning neutron stars, the extremely dense and heavy crushed cores leftbehind when a massive star explodes. The pulsingradio signals from the stars are thought to be caused by narrow,lighthouse-like beams emanating from the stars' magnetic poles. If a star'sspin axis doesn't align exactly with its magnetic poles, these beams sweepacross the sky. The pulses can repeat in anywhere from a few milliseconds to afew seconds. If one ofthose beams happens to swing in Earth's direction, astronomers can detect thesignal with radio telescopes. Unfortunately that makes any census of pulsarsautomatically biased because it can't count the pulsars that don't send theirbeams our way. "Thathas colored our understanding of neutron stars for 40 years," Romani said. And whileradio beams are easy to detect, they account for only a tiny fraction (a fewparts in a million) of a pulsar's total power. Gamma rays, on the other hand,account for 10 percent or more. That's where Fermi comes in. "Forthe first time, Fermi is giving us an independent look at what heavy starsdo," Romani said. A pulsar'sintense electric and magnetic fields and rapid spin accelerate particles toclose to the speed oflight. Gamma rays let astronomers glimpse the particle accelerator's heart. Fermi'sobservations of gamma rays in new and previously known pulsars is forcingastronomers to revise their picture of how these particle accelerators work andhow the gamma rays are emitted. "Weused to think the gamma rays emerged near the neutron star's surface from thepolar cap, where the radio beams form," said astrophysicist Alice Harding ofNASA's Goddard Space Flight Center in Greenbelt, Md. She helped present thefindings. "The new gamma-ray-only pulsars put that idea to rest." The picturethat is now emerging is one of pulsed gamma rays arising far above the neutronstar. 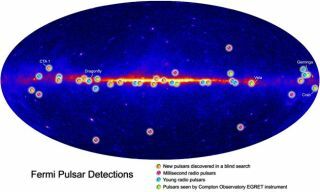 For theVela pulsar, the brightest persistent gamma-ray source in the sky, theemission region is thought to lie about 300 miles from the star, which itselfhas a diameter of just 20 miles. Particlesproduce the gamma rays as they accelerate along arcs of the pulsar's openmagnetic field. This model means that gamma rays would be beamed broadly acrossthe sky, not in the narrow beam like the radio signals. Thisfinding "puts the nail in the coffin of the classic polar cap model,"Romani said. There isstill some debate as to whether gamma ray emission starts at high altitudesover the star or from the star's surface and emanates all the way out. "Sofar, Fermi observations to date cannot distinguish which of these models iscorrect," Harding said. Fermi alsopicked up pulsed gamma rays from seven "millisecond pulsars," socalled because they spin between 100 and 1,000 times a second. These rapidrotators, even by pulsar standards, move at up to one tenth of the speed oflight. Far olderthan "normal" pulsars such as the Vela pulsar, these speed demonsseem to break the rules because pulsars tend to slow in their rotation as theyage (the 10,000-year-old CTA 1 pulsar, which the Fermi team announced inOctober, slows by about a second every 87,000 years). Millisecondpulsars seem to get a second lease on life because they reside in binary starsystems. As their companion star ages and expands, it does so to the pointwhere the pulsar can start to siphon off material, forming an accretion disk.The accretion disk has force that speeds up the pulsar, allowing it to rotate "atthis furious rate for about a billion years tomorrow," Harding said. Thesediscoveries are likely just the beginning of what Fermi will find in terms ofnearby pulsars, Harding said. "We probably will be discovering a lot more."